SprutCAM has the embedded high quality multi-axis mill/turn machining simulation module. The module allows exact simulation and error checking of turning, threading, drilling and multi-axis milling. to optimize the feed rates. 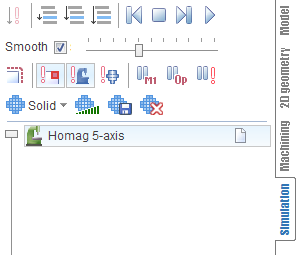 While simulating mill operations true solids are used to represent a tool and a workpiece. Thus, the quality of a resulting workpiece does not rely neither on the tool or the view orientation. The used method ideally suit for multi-axis simulation. While simulating turn operations solids of revolution are used to represent a tool and a workpiece irrespective to the form of the source models. It is so to gain an effect of a revolving workpiece on a machine. If a mill operation follows a turn one, the true solid model is used for its simulation again.